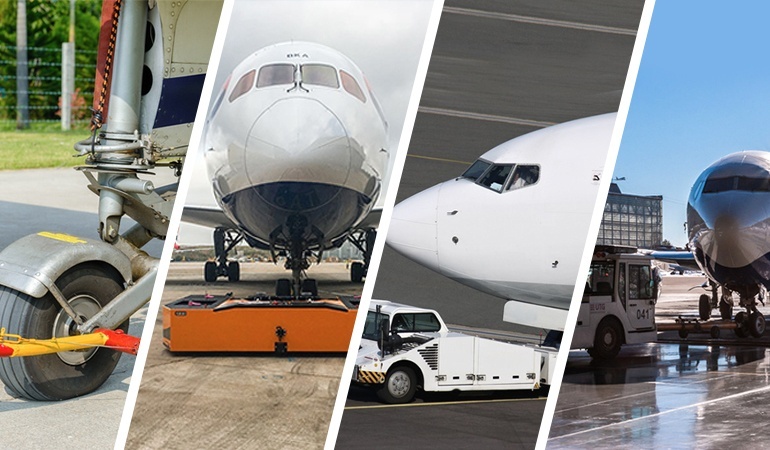 Aircraft tugs can be found at every hangar and every airport, worldwide. Their features depend on their purpose. Hence tugs can be for example divided into groups by their thrust. Or depending on their type of drive. Or you distinguish them based on their design. One feature doesn’t exclude another, though. 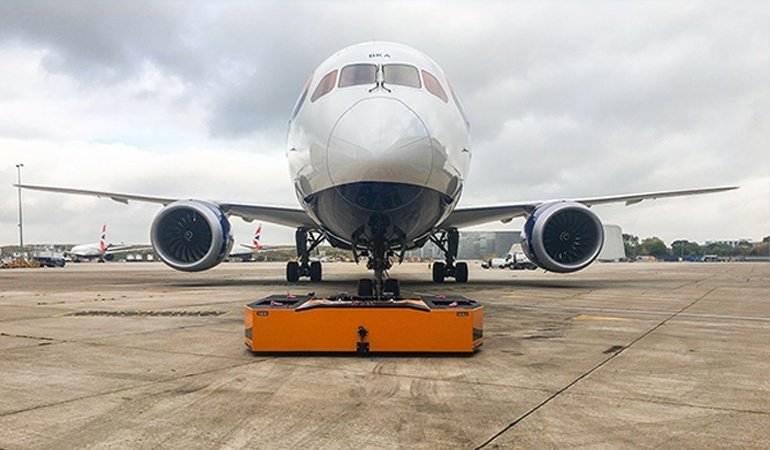 Just because you have a powerful aircraft tug, that can pull up to 195 t (nearly 430,000 lbs) doesn’t mean it can’t be battery powered. Look down on yourself. Shoulders… arms… ah, and there it is! The simplest way to move a light-sport aircraft or another small plane: your bare hands. Once in motion, these airplanes can be moved around by hand since they are on wheels. Whoever pushed a car once knows that the force it takes to set such a vehicle in motion is nothing compared to its actual weight. Some propeller planes can even be pulled by their propeller – yeah, it’s strong enough. It holds the plane’s weight in the air, after all. Admittedly, pulling a plane by hand can be a cumbersome procedure. An easy and cheap helper is a simple tow bar. These devices are often made of aluminum and therefore very light. You attach them to either the nose wheel or the tail wheel of your aircraft and obtain a practical handle you can steer the plane with it. Its small size and weight even allows to take such a tow bar along on the flight. So you have a tow bar, but somehow you still have to do everything with your own manpower. Where’s the fun, right? That’s what people must have thought when they decided that tow bars should have an engine. Ever since tugs and massive tractors with tow bars help pulling aircrafts from A to B. An engine powered vehicle is quite useful, especially when it comes to heavy aircrafts that weigh hundreds of tons. What used to be a blessing in the flourishing aviation business of the last century has slowly become a relict of an outdated technology, though. Not only does every airplane type require a specific tow bar, taking spontaneous maneuvers off the table. But the mechanics of a tow bar tug are actually pretty much outdated. The cockpit needs to be occupied for every operation and the gross motor skills of tow bar tugs deny clever parking and small turning circles. In aviation time is money, so abandoning your old tow bar tractors can actually save you cash. But for what alternative? Given these obvious downsides of tow bar tugs it was quite evident that there had to be another solution. That’s why in the 1980s the first towbarless tug was introduced in France. Since then it has taken the world by storm, cutting out conventional tow bar tractors from many scopes of ground support. The wheel of the aircraft is hydraulically picked up, placed and fixated atop of the tug. 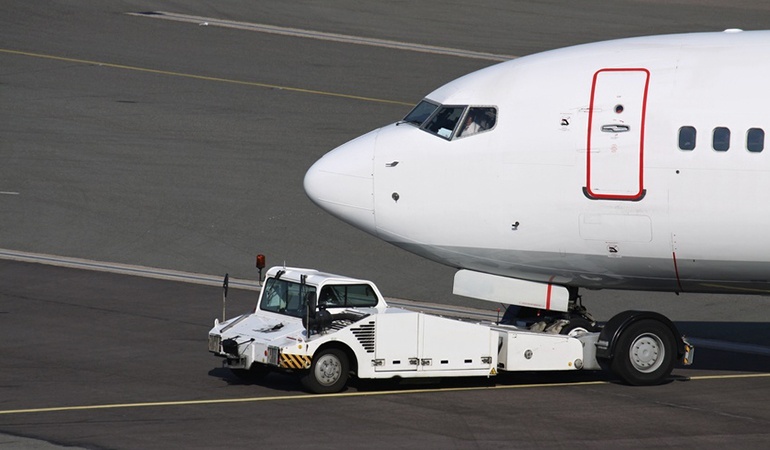 Therefore one aircraft tug fits a wide range of aircrafts and does no longer rely on an adapter such as a tow bar. No doubt: A towbarless tug has plenty of advantages over a tow bar tractor. But it is still not the measure of all things, particularly because of two major minuses: the technology and the handling. For one thing using fossil fuels on your GSE is simply a waste of resources and pollutes your working environment. For another thing operating a generic towbarless tug requires multiple people at a time, one of them sitting in the tug steering it. This doesn’t only raise your personnel costs. 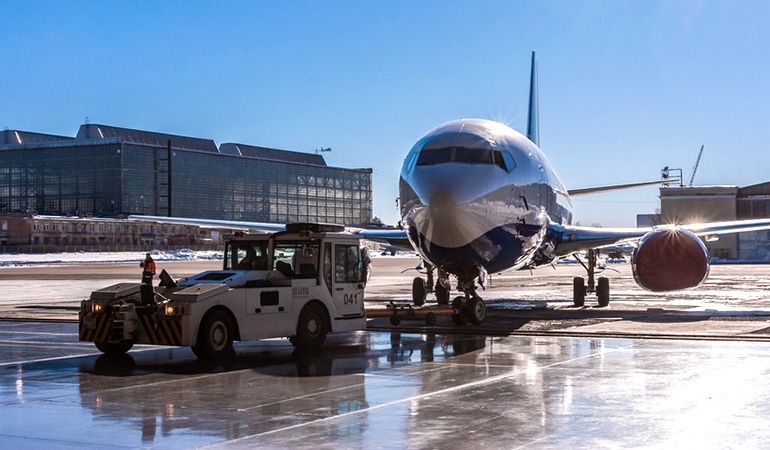 It comes with a risk for both your employees and the aircrafts and GSE involved, since human errors are more likely, especially with not automated tugs. The consequences could be observed for example in early 2016 when Iron Maiden’s 747-400 was damaged and two workers were injured in a tug collision. A 2008 study by the Institute for Automotive Engineering (ika) at the RWTH University of Aachen, Germany came to the conclusion that it’s only reasonable to replace diesel tractors with electric tugs – both economically and ecologically. The study assumed that hybrid systems will be the next step. In the same year Mototok decided to jump ahead of its time and released its first all-electric remote-controlled aircraft tug, eliminating all problems mentioned earlier. But I used diesel tractors my whole life, why should I switch to an electric tug? Is it really that good? As you see: Yes. Yes, it is. The future runs on electricity. If you invest in battery powered equipment today you don’t only make a wise, farsighted and economical decision. You also improve the air quality at your airport and thus the working space for your staff. But Mototok isn’t simply about having an aircraft tug running on electricity. There were already several vehicles on the market that are battery powered but still look exactly like the typical diesel tractors, but this isn’t the only point. Mototok is about revolutionizing the way we handle ground operations – for example with its remote control. Now every ground operation can theoretically become a one-man show, reducing personnel costs and the risk of error. The remote control provides security to workers, aircrafts and airport facilities. And in addition, the space-saving size of Mototoks electric tugs grants full flexibility and mobility. 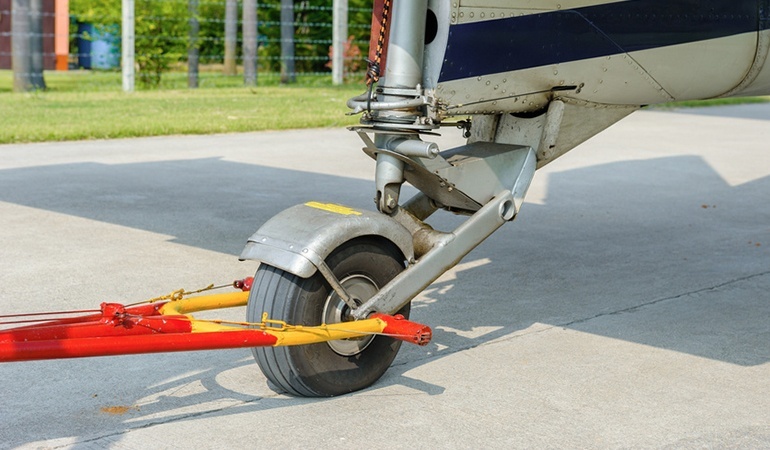 If you are pondering on buying an aircraft tug right now, choose whatever is best for the safety and success of your business. We are happy to counsel you on this important question – for free. Simply write us a quick message and we will be glad to help you! Get weekly lessons to improve your ROI. 100% free and no spam.